Samsung is going to officially unveil the Galaxy Note 8 on August 23. We’ve already seen many leaked images and renders of this smartphone. There have also been countless reports detailing the specifications and features it’s likely going to have. The leaks won’t stop until the handset is officially announced so it’s not surprising to see something new pop up. 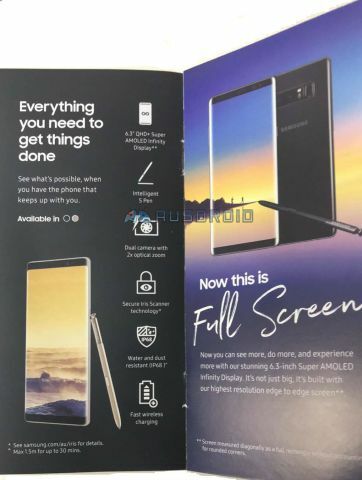 The folks at Ausdroid have received a leaked sales brochure for the Galaxy Note 8 which confirms some major details about the handset. The leaked Galaxy Note 8 brochure confirms that the Galaxy Note 8 is going to feature a 6.3-inch QHD+ Infinity Display with S Pen support. It’s also going to feature an iris scanner and wireless charging. The Galaxy Note 8 will be IP68 dust and water resistant. The Galaxy Note 8’s dual camera will have f/1.7 lenses with support for 2x optical zoom and Optical Image Stabilization. 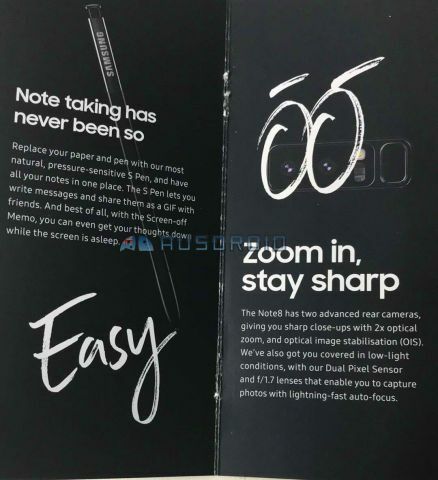 Since this is a Note device after all, it will be very easy to take notes, the Screen-off Memo feature will be onboard to jot down notes with the stylus even when the screen is off. Samsung is going to offer it in Midnight Black and Maple Gold colors, as far as the Australian market is concerned. The new Deep Sea Blue color option may be limited to select markets. 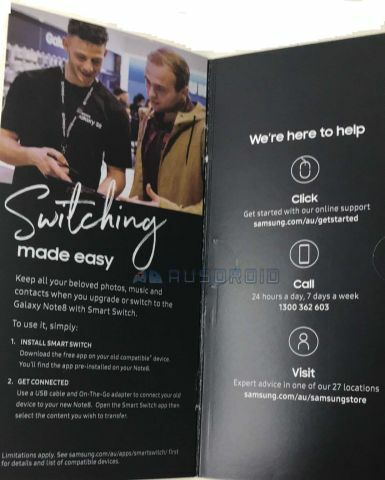 The brochure doesn’t reveal any pricing information for the Galaxy Note 8. Do Bigger Things or Longer Things?? ?, Not a fan of this lengthening form factor.. I need a phone, not creating bridge between cities..
Wow, even Samsung are calling two fixed-focal lenses an “optical zoom”. I guess I can now sell off my old SLR primes, two at a time, and call them a zoom lens? Actually you’d wonder what discussions you can hear from average Joes, who take that PR stuff literally so far that they mean professional cameras are as good as their phones … or even worse, since they don’t take snapshots in 4k with a gazillion megapixels. I have a 8MP Canon which cost me roughly 100$ when it came out 10 years ago … and it still is miles ahead of phone cameras … alone through its optical components. but times have changed..and lazy photography has taken over…and it is becoming almost universal…but creativity has no boundaries..in terms of future phones and also in terms of human potential of human creativity….and so… who knows what future humans will dream up next…even as early as tomorrow or next year….